Oh man, look at those cave men go.. I must admit I was a bit surprised when we got to not particularly far away Corby at the lack of familiar faces in the busy crowd at The White Hart. Of course there were a fair few as ever – reassuring that a sell-out can be achieved in a new town in terms of playing, I guess! We got there early, had a quick drink a nearby funky cocktail bar (the perils of needing the loo, seeing a bar called ‘Malt-something’ and assuming it was an ale pub, ha!). Some chips from the chippy and we were good to go. The venue was the backroom of the pub, a work in progress the landlord was telling me, but workable enough – it was evocative of the kinds of places we used to go see Ferocious Dog years ago – but in this case very much full of people! A nice mixed crowd in terms of age and look – there were FD t-shirts a plenty, folks who perhaps didn’t normally see them, plenty of kids – a really good mixture. First up on stage was Emma McGrath (accompanied by Alfie on drums), she has a new single out next week, and is off on tour supporting Hayseed Dixie too. She started off on guitar and wow, what a voice she has! I’m going to guess the opening song was called either Don’t Leave Me Behind or Lifeline, really engaging – I’m sure there was some jiggery pokery going on with the drumkit alongside traditional drums too. A really full sound for just the two of ’em. 2017 – the ‘slow down year’..
Whilst I always seem to be busy, 2017 was a quieter year than the last couple – that’s borne out by the blog activity, 68 posts this year compared to 90 in 2016. Home ownership, life events and an inherent need to slow down a little bit (but only a little) took its toll. There were a few occasions where I bundled events into single mega-posts rather than splitting them out that might be artificially manipulating the statistics downward. But on the music front it’s been another belting year, regardless! January got underway pretty late with a trip to Droitwich to see Nick Parker and Paul Henshaw, an ace gig and a chance to finally put a visual reference to a place that had always stuck in my mind from DFS adverts of yore. Now I’m just looking to head to Darley-Dale and Measham for gigs and I can tick off the sofa-based trilogy of places from those cursed interludes that used to plague us between films around Christmas in the 80s and early 90s! 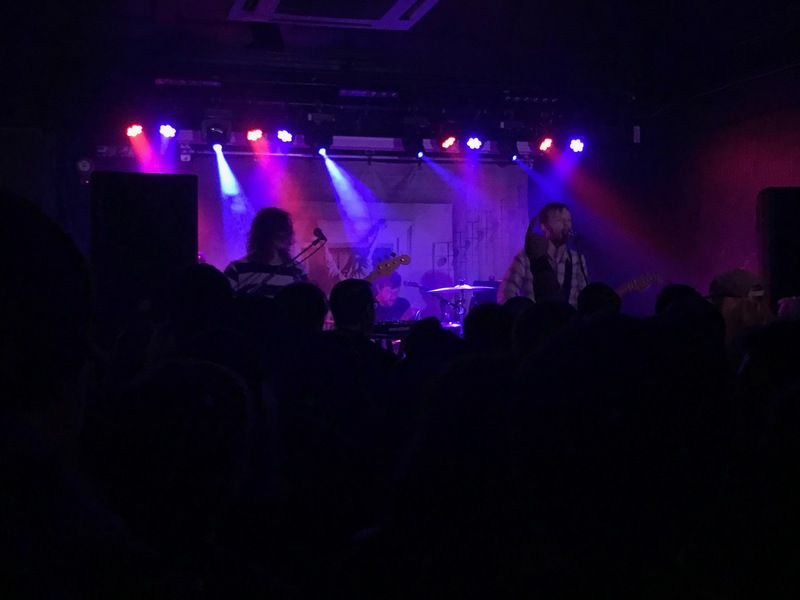 February was a little livelier, we had a trip with off-duty Nick Parker to see previously unheard of Kevin Devine in Nottingham which was awesome, great support too from The Lion and the Wolf and George Gadd. 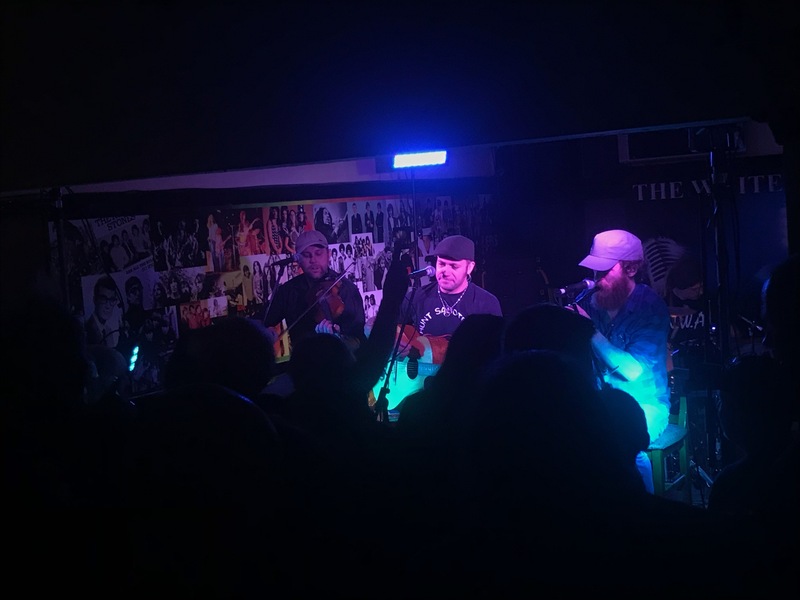 Ferocious Dog dropped their From Without acoustic album to us which went down very well indeed, whilst Mad Dog Mcrea played an amazing set in Nottingham along with The Outlines and Star Botherers (I’m not sure if they’d officially dropped the ‘the’ by this point!). The West Country’s always been good to me.. 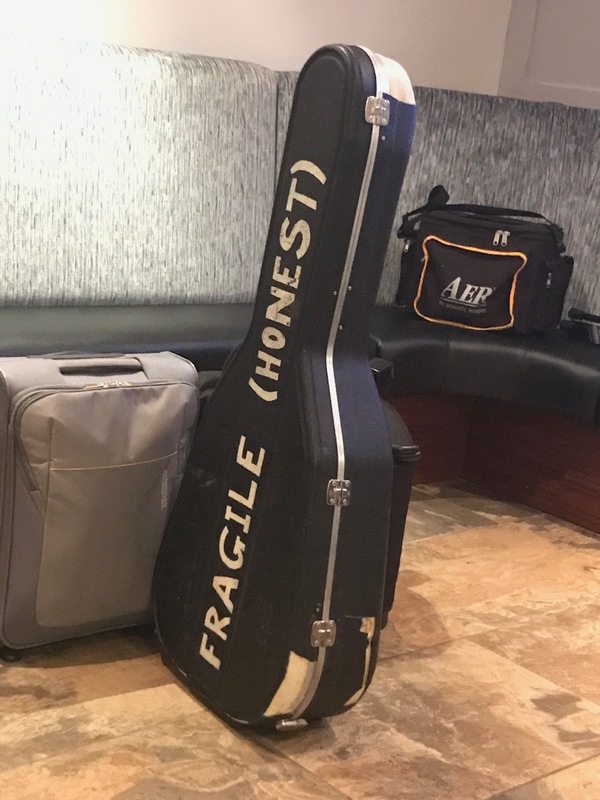 Ever since I’ve got into Gaz Brookfield I’ve always harboured an ambition to see him play closer to home, particularly one of his Christmas shows. Then they always seemed to clash with Dogfest, but this year it didn’t – so I booked tickets aaaaages ago along with a hotel and consigned it to something to be excited about. Then Ferocious Dog announced they were playing Weston Super Mare the next day, well, I was practically there wasn’t I? So I booked tickets and a hotel. A support of The Leylines Duo made this doubly exciting. Then to compound matters Nick Parker announced a full band gig at Bocabar in Glastonbury on the Friday night before – well, y’know, since we’re in that neck of the woods anyway – it would be rude not to wouldn’t it? An extended weekend of gigging taking in some of my very favourite live performers in a last hurrah before Christmas takes over. So Nick was up first – Ella trained to Solihull where I was working so we could hit the road to Glastonbury. A pretty good trek down there found us at the Premier Inn, and a fully booked restaurant next door. D’oh! 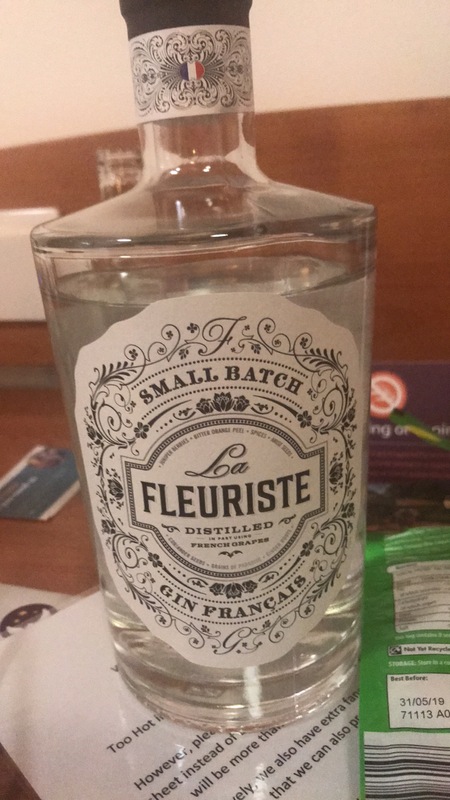 Luckily we found an Aldi nearby (there’s not a lot else!) so ended up stocking up on stuff there for something to eat before heading to the venue just over the road from the hotel. 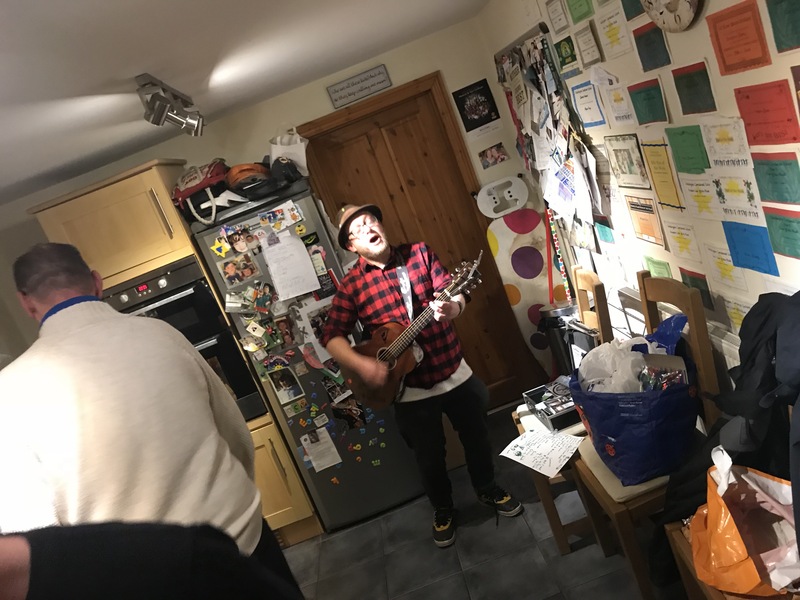 As if Dogfest isn’t a prospect mouthwatering enough for your musical delectation, Bart runs a pre-Dogfest night to get you limbered up for what is to follow – so I decided to bash the two reviews together as a further time-saving measure (given I’ve got three gigs coming up this weekend, d’oh!). We got ourselves up to The Black Market Venue in good time and for a mere fiver were granted entry to the back room where both stages were being utilised to put on an amazing line-up. 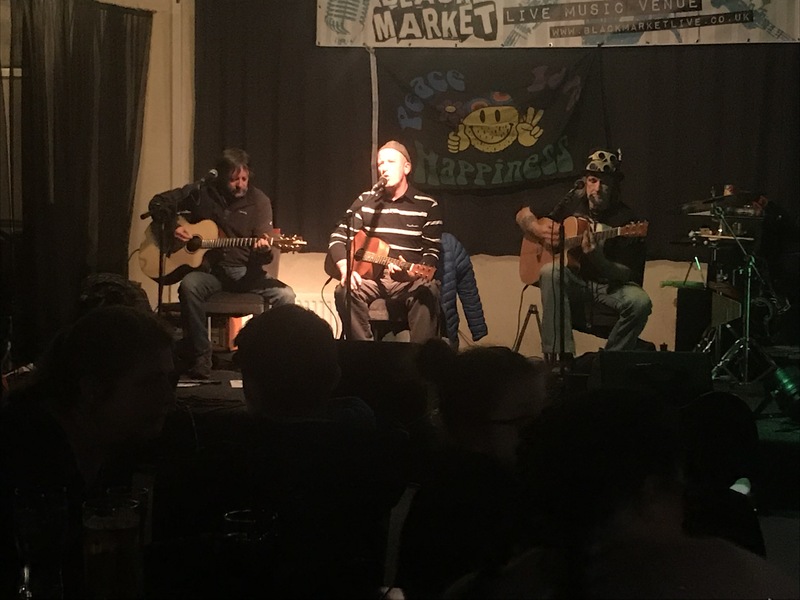 First up on the side stage were 3 Wise Men, acoustic mellow tunes with all three of ’em providing vocals at one point or another and well synchronised guitars. In The Cold Cold Night was early in the set which was followed up with That’s Life. I was really enjoying the set – especially a cover of Massive Attack’s Man Next Door which was simultaneously unexpected and delightful in equal measure – well worth getting in early doors for (not, of course, that the event started on time – arf!). The Outlines were up next on the main stage – looking ever more confident in their own skins, launching into Waiting and filling the room with energetic grungy rock, a stark contrast to the gentle set before but just as enjoyable. Static, She Don’t Know, Calm Down – all quickly establishing themselves as classics. Next up was probably my favourite of theirs (for now) in Buried a Lie. Tight backing vocals and Kyle’s distinctive voice over an unfeasibly heavy sound for three of ’em.. There ain’t no party like.. TWO house parties! Because I’m so ridiculously behind on blog posts, I’m going to combine an entry for two excellent house gigs – the first was hosted by the lovely Parry Clan and featured Morganella and Doozer McDooze doing their thing in an intimate and unplugged setting, the second was hosted by the equally lovely Fairish Clan and featured The Star Copiers and Nick Parker all amped up – along with a raucous open-mic finalé – I’m very lucky to have the opportunities to go to such awesome events! So first up was Parry Towers. I’d arrived early and Lucy and Nick had laid on a mountain of food for the revelry, so after troughing and discovering the wonder of the Akinator phone game with Evan, eventually guests arrived and it was time to start getting set up. Morganella were up first in support guise – they’d had a quick rehearsal beforehand which they don’t get to do very often (at least not in the same place), but in no time found themselves a spot in the lounge to act as the performance area. Kicking off with Black Horse and a Cherry Tree it sounded really good – my limited dalliances into singing have made me really appreciate the wonders of what a monitor does, so to perform fully acoustic is always impressive to my ears (well, if it’s in tune! And it was!). Self-penned track Daisies and Sunshine was up next and straight into Refuge and The Standing Stone of Onich to showcase their own EP tracks. They don’t get away without playing Weak these days, so that featured next followed by Photosynthesis which is one of Nick’s favourites. 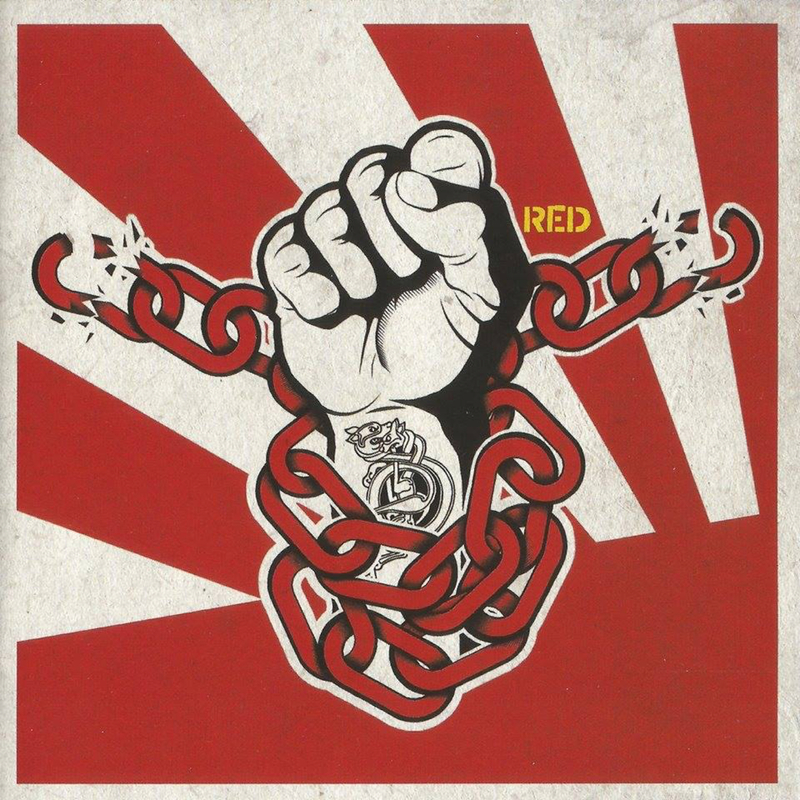 The Red Album is no red herring.. I remember when From Without came out I wrote about that difficult second album – the original Ferocious Dog self-titled album was a canon of years of built up song-writing, and a lifetime to date of experiences to draw upon for subject matter. Subsequent works are always gonna deal with less life back-history, and with more weight of pressure. But well, I feared in vain – From Without was an undoubted triumph – so I should’ve learned really and not worried about The Red Album, but still, you just can’t help it can you? I’d heard bits and pieces of live performances, rough cuts and sneaky peeks, but hadn’t heard the final product in earnest ’til Dean popped it on the minibus on the way to The Netherlands last weekend, and even then the excitement of our impending trip (or desperation of Mark’s bladder situation as we blasted into Hull right up against the deadline for the ferry) meant that it probably wasn’t the environment to really sit and take it in. Luckily when I arrived back from the trip it was waiting for me on my doormat so I’ve quickly been familiarising myself with it, and by gosh, they’ve only gone and done it again. Unlike From Without, which was an expensive endeavour in a swanky studio with recognised producers and masterers, the band have looked closer to home and recorded it at Electric Bear Studios under the watchful eye of Phill Wilbraham. Having seen Phill at work he does more than just record tracks and choose levels, even in the couple of hours I spent in the studio he was making lyrical suggestions and tweaks, and extrapolating the logistics in rendering recordings that would be replicable on a live stage. He’s a clever guy, and the quality of the recording is a real testament to his skills. Doozer and Funke rock Derby! 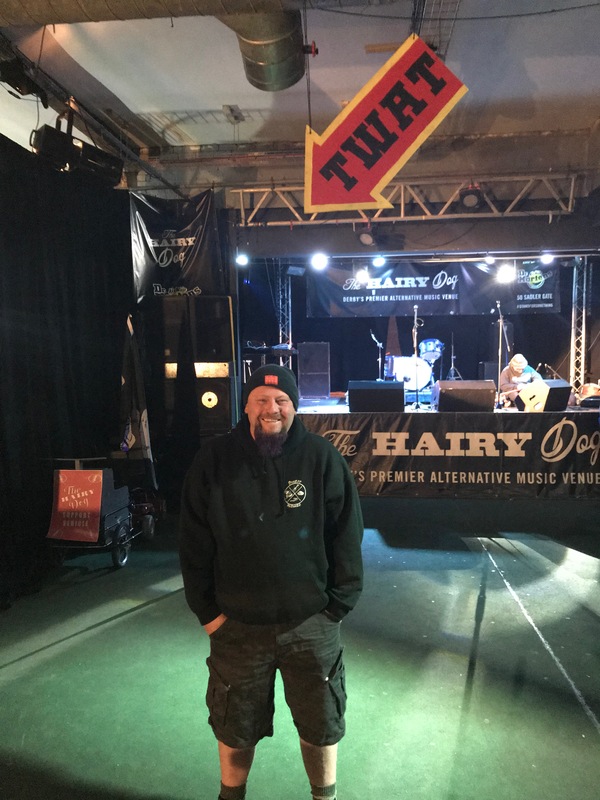 I’ve not been to The Hairy Dog in Derby for a year or so – so last night was a first chance to check out their new bigger room rather than the old upstairs venue which now houses a smaller venue and a tattoo studio. The newer main room is a great space – around a 400 capacity, a bar with sound-desk, cloakroom and merch desk with a good sized raised stage. It’s superb set up nestled behind the no-nonsense rock pub out front. I whole heartedly approve. With car woes continuing I decided not to risk it and took the van, parking up at nearby Abbey Street car park and then it was a short walk to the venue. Outside we found the acts for the evening out front enjoying a drink along with The Famous Artist Birdy Rose too, so we settled down for a natter and a drink. It was a little while before the doors to the back room were opened, so it was nice just to catch up. Gradually other gig goers started to arrive – and soon enough we decamped into the main room, Ella doing a stint on the merch desk for the evening. Funke was up on stage to introduce Doozer McDooze who opened up the live music – despite being a bit poorly (you could only really tell from his between-song chatter, it sounded like he had a bad throat), he didn’t let it inhibit an energetic and empassioned performance though! I didn’t recognise the song he opened with, I’ll hazard a guess at I Thought We Were Friends. It always amazes me how prolific Dooze is at songwriting, I see him quite frequently and there’s nearly always something in his sets to throw me! The gig that launched a brace of albums.. The Black Market Venue was resplendent with candlelit tables and black table cloths, the curtains were pulled across (initially at least!) to make what is a cavernous space feel more intimate, red and black balloons bedecked the place (including some HUUUUUGE ones by the stage!). 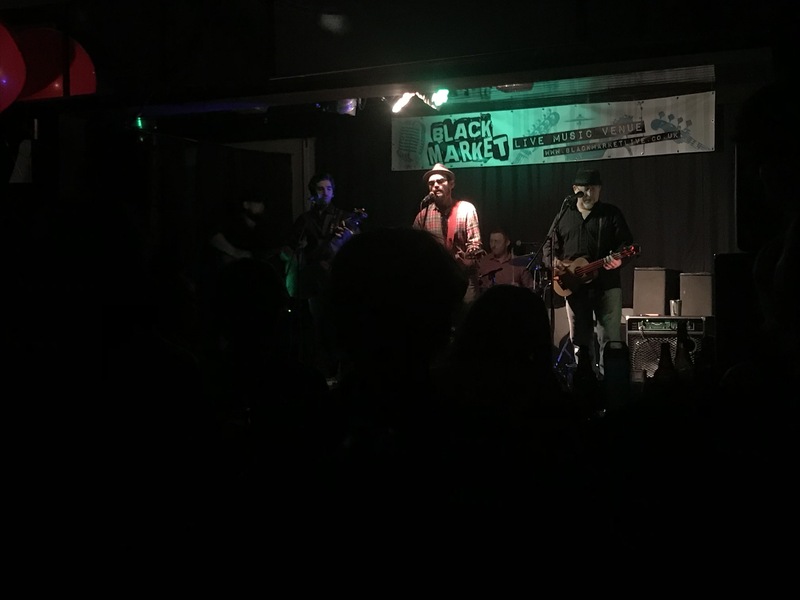 The room was filled with possibly a larger crowd than anticipated – eagerly ready to support the album launch for not just Star Botherers, but Strange Currencies too – and if that wasn’t enough, there was a set by Black Thorn to get the night underway! Jamie had been kind enough to give us a lift up to the venue – so I could have a cheeky pint of Illicit or two for a change – and not have to gamble a trip in my increasingly erratic car (but that’s another story!). By the time we were herded into the back room by Brad there was a sizeable gathering in the front bar, but unbeknown to us there was quite the crowd already ensconsed in the back room – tables had filled up, we installed ourselves by the bar, by the time Kev, Julie and the kids arrived the curtains had to go back to make room for everyone. I’m really glad about that – it’s great to see so many people out to support local independent and unsigned artists. As well as an album launch it was a showcase for The Black Market Venue’s recording facilities – where, of course, Happy Angry was recorded, and is headed up by Joel. Venue, bar, brewery and now recording studio – certainly a diverse establishment! As we got ourselves settled in Black Thorn were getting themselves soundchecked – and soon enough were underway. Star Botherers are Happy and Angry with a new album! I’ve been looking forward to Star Botherers releasing their album ever since it was announced it was in progress – and by gosh it doesn’t disappoint. I think all but one of the generous fourteen songs on here I’ve heard performed live, and there’s a fair few that have appeared on EPs released before. But these familiar friends have been lovingly caressed and enhanced in the studio so even these songs you think you’ve heard before take on new and interesting dimensions without losing their charm. The once semi-novelty duo – mixing in originals, cover versions and games of bingo into chaotic sets, have been slowly but surely building their portfolio of songs and once you see them laid out here you realise it’s quite an impressive canon. 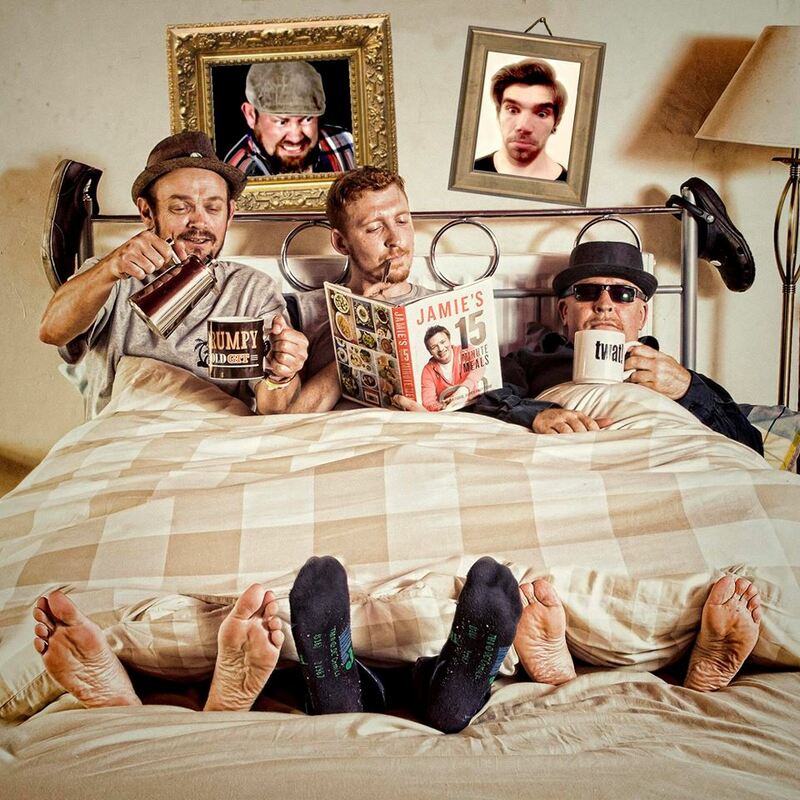 They’ve managed to retain their fun and irreverence whilst adding layers and sublime production. Brad has of course joined often on stage to add more intricate percussion, and we’ve seen both Joel and Ellis add extra stringy things of late – and the album is full of this. Joel too has been responsible for all the technical wizardry in mixing and mastering the now more complicated audio channels – we know from Black Thorn’s album how adept he is at this, and this will sit alongside that as a fine testament to his technical skill. This really is an album to be proud of – the songs rollercoaster you from amusement, nostalgia, cutting political observations, meloncholy and at times downright hilarity. Bart is a very clever lyricist and he’s assembled an expert team to augment his guitar in accompanying the words. When there’s something strange in the neighbourhood..
Well this weekend we’ve discovered that The Lindleys can host one hell of a party! With Doozer McDooze embarking on a series of house gigs, they threw their house and garden open to the masses for a Hallowe’en themed party, nay, mini-festival. 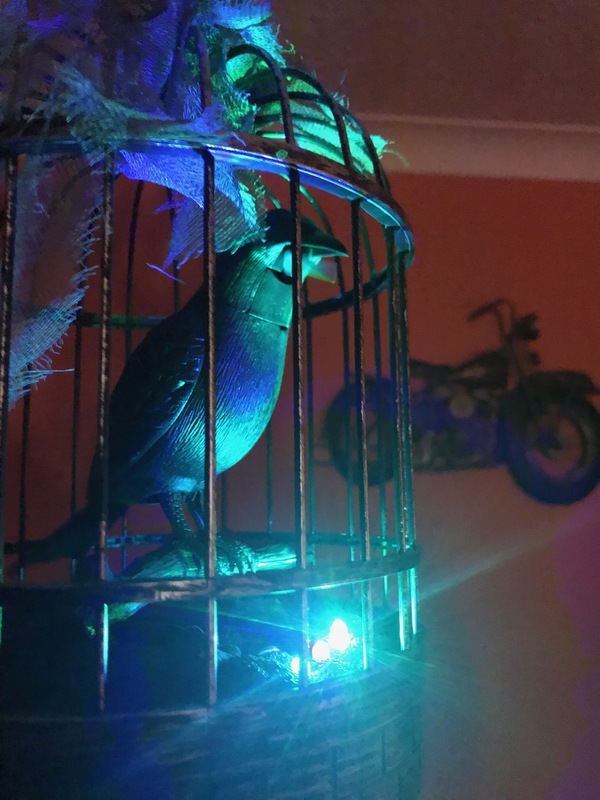 John had made a stage in the garden from pallets, chipboard and a gazebo, Russ had provided a PA and lighting, and Angela had really gone to town on spooky decorating to create an amazing space for the guests descending for good times and entertainment. Not only did we have the treat of Doozer’s set, we had four acts preceding him. We arrived in the car – Ella had dressed up as an undead Romany girl, I’d dragged out my evil jester costume – certainly the other costumes on display from the guests were impressive – most folk had really entered into the spirit of it, and were tucking into spooky snacks or mysterious glow-in-the-dark jellies. A sinister bird chirped in the kitchen, whilst even the toilet had been made to look suitably eerie. The weather was very kind and the firepit gave the option of heating up if it did get a bit chilly, and there was a dazzling array of warming food inside – the forty or so odd revellers were very well catered for indeed! In the meantime though the first act up on the stage was Dusty Herb, for the second time in a week for us! He started up with Sometimes as last week, and was sounding really good – and followed it up with Black Dogs Eyes again – the fact he forgot the first verse makes me feel better for once again not noting his third song (might be partly down the food becoming available, haha!). It’s the Ferocious Dog day that just keeps giving - a new video for Spin!